Telangana Government is all set to transform Yadigirigutta in to a Temple City which will be bigger than Tirupati Balaji with an investment of Rs.1,200 crores. The proposed Temple City will spread over an area of 850 acres. 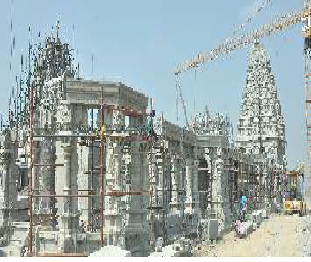 The first phase of Yadadri Temple City has already been finalized which includes renovation of 900 year old Laxmi Narasimha Swami Temple known as Yadadri Temple in an area of 250 acres. The first phase also include 200 cottages for pilgrims in 86 acres, food courts in 3.5 acres, water and drainage system will come up in seven acres and greenery in 12 acres, roads in another 68 acres, landscaping in 26 acres and beautification will be done in 42 acres. The first phase is proposed to be completed in one year.